Admission to explore our collections is included with your ticket to possibly the most vibrant and active collections of aviation and military rarities. There's flying going on pretty much every day that the weather permits, so expect to see a thirties biplane droning over with a load of passengers. And seeing - and hearing - a Spitfire roar by is a common sight. Meanwhile, on the ground, climb aboard some of our historic airliners to see how passenger flight was experienced half a century or more ago. On many days, you'll be able to watch Concorde demonstrating its unique shape-changing act, or even experience the thunder and spectacle of one of our tanks. Leave the M11 at Junction 10. At the roundabout, follow the signs for Royston A505 and Imperial War Museum. Take the left-hand lane, also marked Imperial War Museum, and watch for the Hurricane gate guardian. Turn in and follow the road left into the car park. From the roundabout north of Royston, take the A505 towards the M11 and Newmarket. Stay on this road for approximately six miles. 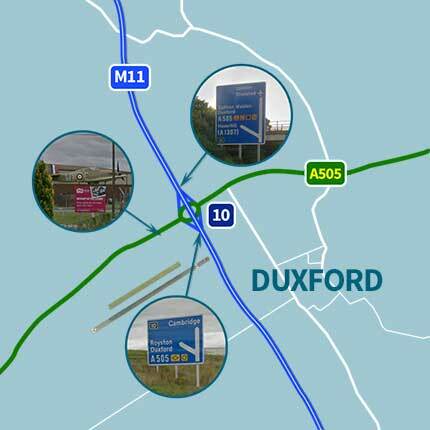 When you see the brown sign for Imperial War Museum Duxford, follow the arrow for Visitors and Conference Centre. Ignore the Staff and Official Visitors entrance on your right. Note that there's no right turn into the museum entrance, so continue to the M11 roundabout and turn back along the A505, taking the left lane to enter the car park. Note that there's no access to the A505 from the A11 northbound. If approaching from the south, use the M11 and follow the directions above. Approaching from Newmarket, look for the overhead gantry carrying the signs for Royston A505 and the M11. Take the left lanes to cross over the A11. After approximately three miles, carry straight on at the M11 roundabout to stay on the A505. Take the left-hand lane, also marked Imperial War Museum, and watch for the Hurricane gate guardian. Turn in and follow the road left into the car park. Clicking the link below will take you to the IWM website, where you can save 10% on your entry price by buying online. Keeping our collection in pristine condition is an expensive business. Every donation, however small, preserves these treasures for future generations to enjoy.